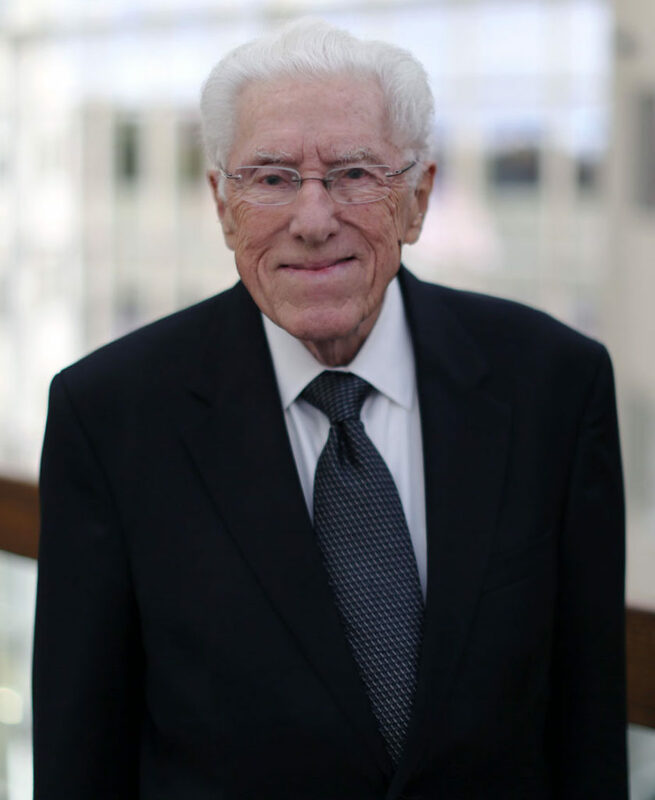 It is with great sadness that Quinn IP Law family says farewell to our friend and colleague Fred Ritchie, who passed away on December 19th at age 92. Fred served in the United States Army during World War II from 1943 to 1946 in the 94th Infantry division and the 1124th Engineering Combat Group. After his service, Fred received his engineering and law degrees from George Washington University in Washington D.C. He passed the bar in both Michigan and the District of Columbia. Fred served as a patent attorney for over 60 years, working 34 years for General Motors in Dayton, Ohio and Detroit, Michigan, retiring as Assistant Chief Patent Counsel. Fred’s most impressive work at GM included winning lawsuits against Toyota patent infringements in both the United States and Japanese Courts. After his retirement, Fred joined Brooks & Kushman, mentoring young attorneys in the procurement and prosecution of international patent rights. Fred joined Chris Quinn in 2002 in the formation of Quinn Law Group, PLLC and shared his extensive experience, passion for continuous learning and desire to help others with our firm until his passing. Fred was preceded in death by his brother, Dr. Lawrence Ritchie, his first and second wives DeMaris (Dee) and Carlotta, and his son, Larry. His memory will live on through his wife, Gail, his daughter, Darsha, his stepchildren, Karen Quinn (Chris), and Michael Urness (Leora), his grandchildren Heather McManus, Dr. Nicholas McManus (Erin), Jaime McManus, and Scott McManus, step grandchildren, Leah, Colin, Lucas, and Lance Quinn, and Bianca, Stephan, Aisha, and Shaylee Urness, two great-grandchildren Colton Frederick (named after Papa Fred) and Aiden McManus, his nieces Mary Lynn Ritchie Meyers, Pamela Ritchie Pelini, Susan Ritchie Cummings, Kristen Ritchie, and their families. Services were held on Wednesday, December 27, 2017 at First United Methodist Church, Birmingham. Interment was at White Chapel Cemetery, Troy, with full military honors. Memorial tributes to Fred may be made to the George Washington University Foundation. For those of us who knew Fred and worked side by side with him, we are better because of him and are forever grateful. Rest in Peace, dear friend.